No matter! There’s room in this world for us all, whether you see yourself as a promoter of editorial love and tolerance, an upholder of clarity and standards, or someone who just wants peace in publishing. Here at Shop Talk, we’re vegging out for the holidays and skipping our monthly Chicago Style Workout. We’ll be back with a new one in January, but meanwhile just for fun we invite you to measure your peeving profile with this grammar survey. It’s all in fun, but if you don’t like your results, feel free to take the quiz again. And the comments are open—let us know how you really feel! 1. Would you rather use whom correctly or sound like a normal person? 2. How do you feel when you see irregardless? Like Sisyphus pushing the boulder up the hill. 5. This line is reserved for those with fifteen items or less. I have sixteen, but who’s counting? 6. They only meant to take three. They meant to take only three. 7. The donuts were for Skippy and I. 8. The insults flew between Rooney, Martie, and Juan. It’s among for more than two. 9. This one’s more perfect. 10. Everyone is smarter than she. At the Chicago Manual Threadless store! 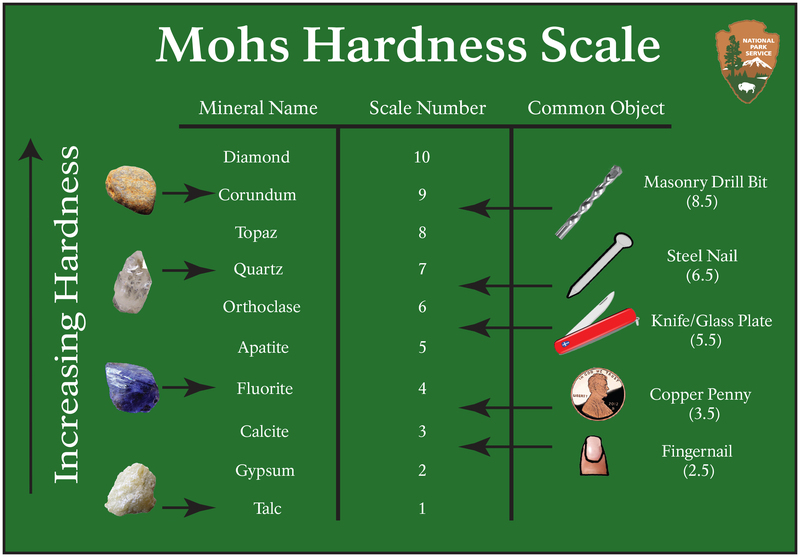 Mohs hardness scale: National Park Service.